Truffles may seem like an expensive ingredient, but not if you know how to use it properly. Learn tips and tricks on how to get the most out of your truffle! Place the cream in a bowl with the eggs, garlic, pickled ginger and some salt and pepper and mix well. Add in the crab meat, ensuring there is no shell, and mix well again. Cover with cling film and place in the fridge to allow the flavours to infuse for at least 30 minutes, but ideally up to overnight. Preheat the oven to 150°C (300°F). Ladle or pour the mixture into the ramekins, making sure you get an even amount of crab in every ramekin, as the crab tends to fall to the bottom. Place the ramekins in a roasting tray. Fill the tray with warm water until the water comes halfway up the sides of the ramekins. Place this bain marie in the oven and cook for 45 to 60 minutes (check after 40 minutes).When cooked through, the mixture should be set but still have a slightly wobbly consistency. Remove the ramekins from the bain marie and allow to cool a little (served warm but not hot). Sprinkle a very thin layer of Parmesan on top of each ramekin and brown under the grill (or use a blow torch). A while back, I met a new friend and we clicked instantly when we started talking about a mutual interest - good food of course! Tracey and her husband Andrew moved to Canberra earlier this year. They love eating out, but they are also a pair of masterchefs at home! She told me about the time that they were holidaying in Jervis Bay for Easter and prepared a 10-course degustation dinner party for their friends! They even had a spreadsheet to keep track of what had to be done when!! I was so impressed by this that I asked Tracey if she wouldn't mind sharing the photos and details of this amazing meal with my readers. Not only didn't she mind, she also gave me a recipe for one of the courses!! So without further ado, here are the photos of each course of this epic 10-course dinner party! Tracey and Andrew have travelled the world extensively and have documented their travels on their blog Foodivores. If you go through the archive, 2010 is Europe, 2012 is Africa and 2013 is New Zealand. Being a humanities nerd, I almost failed high school chemistry but molecular gastronomy has ignited a new passion for science I never knew I could possess. Molecular gastronomy blends physics and chemistry to transform the tastes and textures of food into new and innovative dining experiences. My curiosity about this interesting way of eating was piqued when I discovered a TV show called Heston’s Feasts. In the show, (my not-so-secret celebrity chef crush) Heston Blumenthal, owner of Michelin-starred English restaurant The Fat Duck, experiments with exotic ingredients and tests unusual cooking techniques to prepare magical feasts for celebrity guests. Through shows like Heston’s Feasts and Masterchef Australia, molecular gastronomy is gaining momentum in mainstream cooking and transforming the way we eat and cook at home. Sous vide machines (a water bath with precise temperature control) are the fastest growing kitchen appliance to be sold for the home, so I've heard. In the name of scientific research, I decided to turn The Food Avenue test kitchen into a science lab and create an ambitious sounding and visually appealing dish – raspberry panna cotta with mango caviar and strawberry soil. Basically, a fancy pants panna cotta. But I wanted to see if I could do it without too many weird ingredients or gadgets - so that others could recreate this dish, fairly easily. This dish has three components and requires three recipes – one for panna cotta, one for the mango caviar and one for strawberry soil. Click on the links below to go to the separate page for each recipe. The dish sounds like a fair amount of work, but you can pre-make every component of the dish and if you have dinner guests, all you have to worry about is plating it all up! Raspberry panna cotta This is an Italian dessert made by simmering together cream, milk, sugar and gelatin to create a rich and creamy pudding. You can use any panna cotta recipe, but I used the Chamomile panna cotta recipe in Heston Blumenthal at Home and infused the cream with a raspberry tea rather than chamomile. Strawberry cornflake soil This is the crunch element of the dish and will add a textural contrast the creaminess of the panna cotta. It’s absolutely addictive and dangerously easy to make. I adapted the recipe from Christina Tosi’s Cornflake Crunch from Momofuku Milk Bar and used strawberry-flavoured milk powder instead of regular milk powder. Then, using my mortar and pestle, I crushed the Cornflake Crunch down to a “soil-like” texture. Mango caviar (gelification) The weirdest ingredient out of all three recipes is in this one – and it’s not even that weird. It’s agar agar and you can find it in pretty much any Asian grocery store. Agar agar is really cheap, comes in powder form and sets any liquid at room temperature. It was as easy as boiling a tiny amount of agar again with mango puree and letting droplets of the mixture fall into cooled vegetable oil. 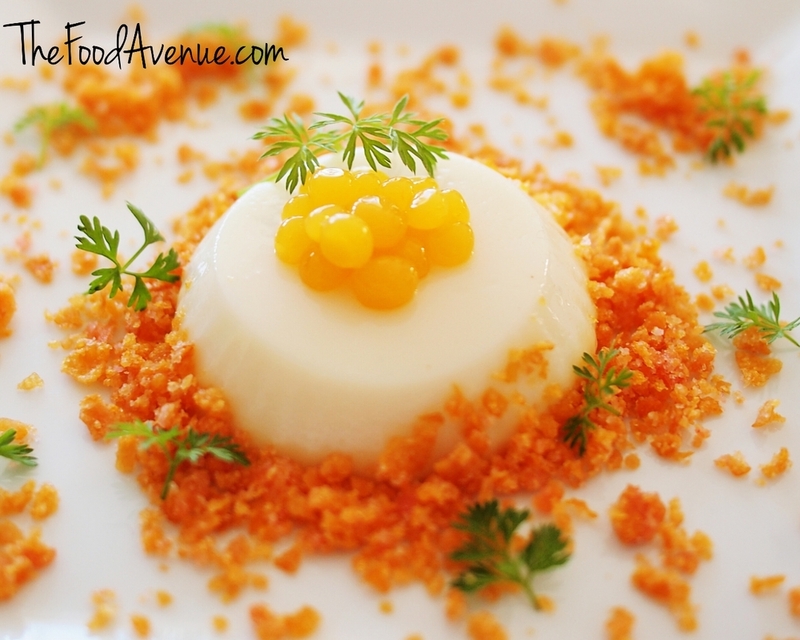 This process created tiny little solid balls of mango puree, which served as a visually appealing decoration. I also tried the same process using beetroot juice and the deep purple colour was stunning against the white panna cotta. The flavour and colour combinations are endless! While I was happy with the visual aspect, the texture wasn't quite like caviar because there was no bursting liquid. I think the next step will be to try the spherification technique, which will mimic the "bursting" effect of real caviar. I’m still a while away from recreating lickable wallpaper and meat fruit but I had so much fun with my first attempt at molecular gastronomy that I won’t be surprised if I soon begin showing up to work looking like a mad scientist! Have you done any experimental cooking in your kitchen? I'd love to hear about your molecular cooking attempts - hit me with any disaster or success stories!